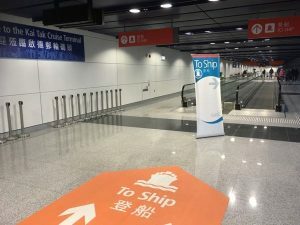 Hong Kong cruise port - Free port guide to Ocean and Kai Tak terminal. Complete Hong Kong cruise port guide with descriptions of all the cruise terminals in Hong Kong, port maps, shore excusions, taxi prices and transportation. Welcome to the Hong Kong cruise port guide. Sailing into Hong Kong by cruise ship is absolutely breathtaking. Make sure you are on the outside deck 2 hours before arrival and the first 2 hours after departure. You will have a great view over the Hong Kong Skyline and all of its famous landmarks. Check out the full Hong Kong cruise port guide underneath to learn about the different docking locations in this city. Cruise ships generally dock at Hong Kong. There are 2 docking locations: Ocean Terminal and Kai Tak Cruise Terminal. Hong Kong provides modern cruise terminals to welcome their guests for the day. Welcome to the Hong Kong cruise port guide. Sailing into Hong Kong by cruise ship is absolutely breathtaking. Make sure you are on the outside deck 2 hours before arrival and the first 2 hours after departure. You will have a great view over the Hong Kong Skyline and all of its famous landmarks. Check out the full Hong Kong cruise port guide underneath to learn about the different docking locations in this city. This is the favoured cruise dock in Hong Kong. Cruise ships can dock straight in front of the center of Hong Kong. The Ocean Cruise Terminal is located in front of the Marco Polo Hong Kong Hotel. The cruise dock is located directly a mall which has over 400 shops in it. It is a 10 to 15 minute walk from the famous Tsim Sha Tsui / Nathan Road. The ferries going to Cental and Wan Chai are all within walking distance. MTR station East Tsim Sha Tsui, exit L5, would be your closest MTR station around. It is only a 10 minutes walk from the cruise terminal. However, it’s not easy to find. Make sure to ask for a map or directions at the cruise terminal. This cruise terminal used to be the old airport of Hong Kong. In recent years they rebuild it into a cruise terminal. Kai Tak is quite far away from any places of interest. Please know you will need transportation to be able to get out of the cruise port. Find a tourist information point at the exit of the Kai Tak Cruise Terminal. They provide good information and brochures specifically designed for this cruise terminal. The port often offers a free shuttle bus service from the Kai Tak Cruise Terminal to the nearest MTR station which is Diamond Hill / Kwum Tong. Here you can hop on the green line of the metro system which can take you to many places in Hong Kong is little time. It is a great way to travel the city! More information about the shuttle is usually given by the tourist information at the exit of the cruise terminal. 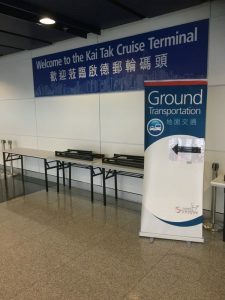 Most cruise lines offer a shuttle service into Kowloon if they dock at Kai Tak Cruise Terminal. 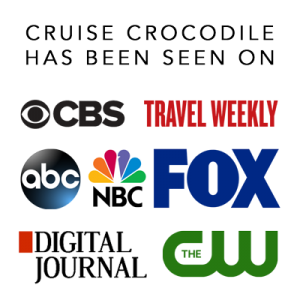 This is obviously a decision that is made by the cruise line and therefore we recommend you to check in with them if they are able to offer it. There are usually not many taxis available at the Kai Tak Cruise Terminal. Keep this in mind when you plan for your day ashore. Taxis in Hong Kong are red with a silver roof top and they run on the meter. Please find an estimate of the one way taxi prices below. This price does not include surcharges for baggage, wheelchairs, crutches and animals. Here are some general tips on how to plan and travel in Hong Kong. The MTR System is an amazing metro system in Hong Kong. It is cheap, quick and accessible! Buy single tickets or a Tourist Day Card for Child, Adult of Elder to ride the MTR. Please know that US dollars are hardly accepted in Hong Kong. Depending on your day we highly suggest you get some local currency either from a currency exchange service or from an ATM. 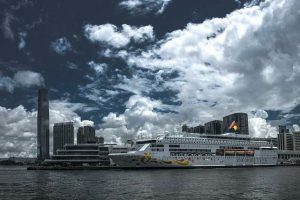 You will find free Wi-Fi at both of Hong Kong’s cruise terminals. In fact, the territory of Hong Kong provides many hotspots where you are able to use their free Wi-Fi for a certain period of time. Both cruise terminals are within range of the hotspots. Simply connect to the network Wi-Fi.HK SSID. The government also provides free Wi-Fi service. This connection is set up in mayor public areas. This connection is called GovWiFi. There is a hop on hop off bus in Hong Kong. It does not come to the Kai Tak Cruise Terminal. It does make a stop close by the Ocean Terminal.